Wolfberry has been long touted as one of nature’s most nutrient-rich natural food. Wolfberry or Goji berries contain 18 amino acids, Vitamin E, and 500 times more Vitamin C by weight than oranges. Wolfberry also contain vitamins B1, B2 and B6. They can be eaten raw, consumed as juice or wine, brewed into a tea, or prepared as a tincture. Perfect cup for anyone do a lot of computer work. Wolfberries are rich in antioxidants, particularly carotenoids such as beta-carotene and zeaxanthin. One of zeaxanthin’s key roles is to protect the retina of the eye by absorbing blue light and acting as an antioxidant. It has a light herby-caramel-carrot taste. 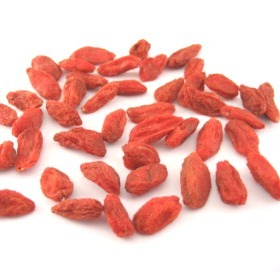 Goji berries are usually found dried. They are shriveled red berries that look like red raisins. In a big glass of hot or cold water, juice or herb tea add one tablespoon of Goji Berries and let them sit and hydrate for a few minutes or put several handfuls in a pitcher and enjoy all day as you drink your own delicious Goji Berry elixir. They will become plump and juicy. Chewing the Gojis as you drink is a wonderful experience. I eat them once in a while. I have been told that goji berries are good for the eyes. I cooked them to get better flavor.